There’s a great deal of debate in the education world about the death of cursive writing instruction. Cursive lovers bemoan the excision of cursive from the curriculum, and are horrified at the thought that someday, these children will grow up and not be able to read their grandparents’ letters (nevermind that their grandparents are now Tweeting, Instagramming, and Snapchatting). But what do they really need cursive for? Important documents are no longer written in cursive. When applying for most jobs, no one will ever see your handwriting until you’re hired, and even then they may never see it. Signatures are generally written in cursive, but it’s generally a stylized, bastardized version of cursive. So why are we clawing at cursive in a vain attempt to keep it in the curriculum? My guess is that it’s a symbol of something larger. A symbol of the death of letter writing, and handwritten Christmas cards. A last gasp of a slower, simpler time. But the times, they are a changin’, and we need to face reality and change along with them. Yes, knowing how to write in cursive is nice. Nice, but not necessary. So instead of allowing the instructional minutes that used to be devoted to teaching cursive to be co-opted into standardized test prep minutes, let’s do something innovative with them! Let’s make cursive time into coding time. Teachers, you don’t need to know how to code; you can learn along with your students. 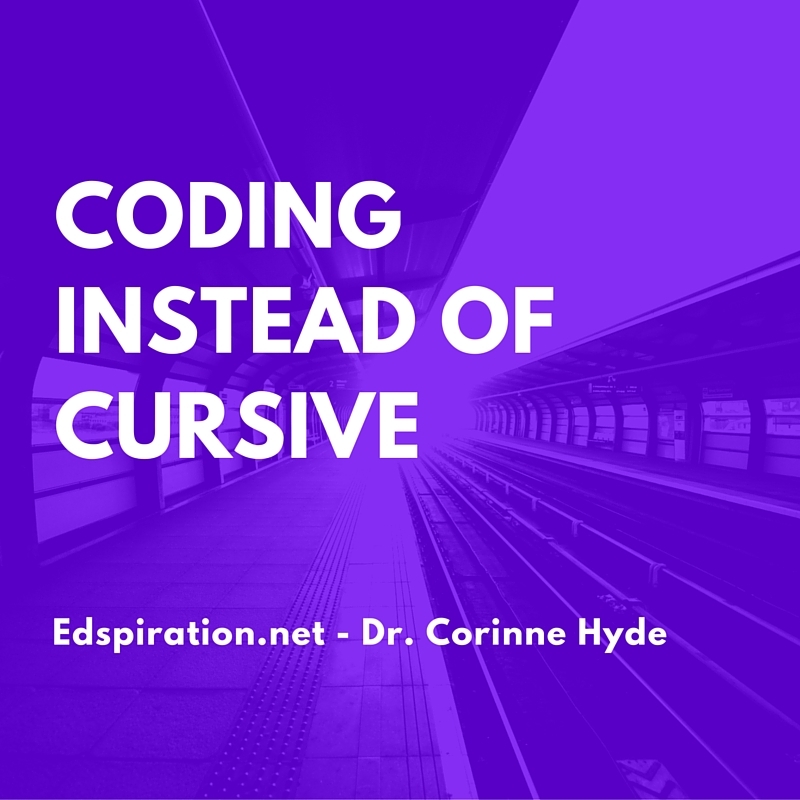 No, making cursive time into coding time won’t turn your students into little professional programmers. But what it WILL do is strengthen their math and logic skills, give them opportunities for creativity, and perhaps spark their interest in a future career. Code.org’s goal is to give every kid (especially females and students of color) the opportunity to learn computer science, especially coding. They have lots of great resources for educators who want to get involved. Pluralsight provides online coding training courses for adults, but has a special free section devoted to teaching coding to kids for free. Code Avengers provides teachers with free access to coding courses, and provides students with 12 free hours of basic coding instruction, plus a free level 1 course. Code Combat teaches coding through gaming! There are 110+ free levels of the game for students, and teachers get free access as well.